Twilight at the Presidio. Photo from Facebook. 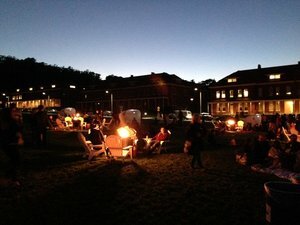 As of October 2nd, ~OFF THE GRID~ expanded their Presidio offerings to include ~TWILIGHT AT THE PRESIDIO~ Wednesday evenings from 5pm-9pm. The new outdoor dining pod is built on the same model as Sunday’s Picnic in the Presidio, but is more evening-friendly, with fire pits, lanterns, and “dining cabanas.” Bar service, including cocktails, beer, and wine, will continue. Food comes from vendors like Edgewater, Little Green Cyclo, and Red Sauce Meatballs, and is served small plates style, to facilitate sharing. Main Post Lawn, Presidio.